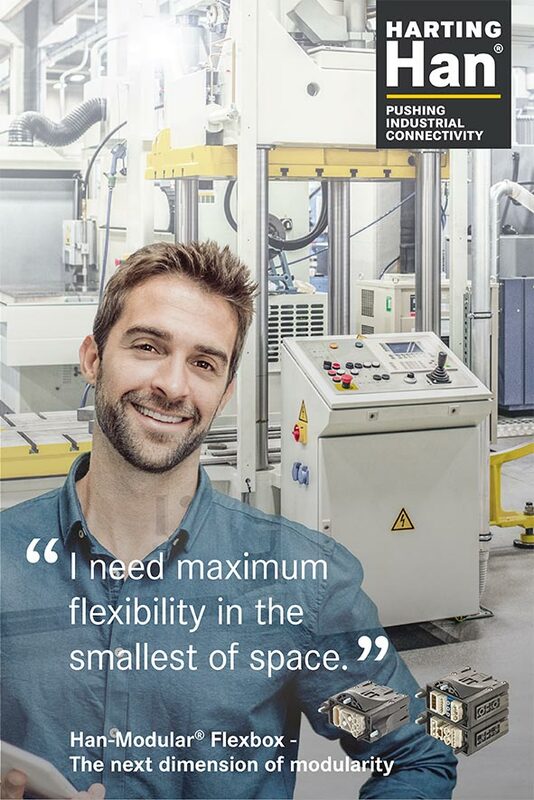 HARTING’s new interface, the Han-Modular® Flexbox, saves time and space. It makes the wiring of machinery and facilities much easier. The industry uses energy chains to supply the linearly moved components of machines or facilities. The chains represent the lifelines of the machines, providing them with energy, data und signals. The Han-Modular® Flexbox is introducd by HARTING as a new type of interface in the form of a modular system of plastic housings. When it comes to the replacement or removal of energy chains, one thing is always missing most – time! Things must go quickly in order to minimise a manufacturing system’s downtimes. Against this background, the use of connectors is a must. The Han-Modular® Flexbox made by HARTING is a novel, an interface made especially for energy chains. The solution allows the designer to divide energy chains into flexible segments that are easier to handle and to remove. The Flexbox’s modular housing concept replaces the previous practice of numerous individual hard-wirings, offering a single interface as a compact overall solution for insertion and removal. Therefore, the replacement of an energy chain becomes a child’s game. In addition, the connector can be easily adapted to the geometry of the energy chain, which results in significant space savings. This results in almost endless combination of possibilities for implementing the right interface for an application. As a result, energy chains can be optimally adapted to the individual requirements of manufacturing systems. Are you interested in the Han-Modular® Flexbox? Register early for your free product sample and experience the next dimension of modularity. The offer is limited: the first 50 requests can be considered. Existing customers are also welcome to contact their sales representative for a sample request.